A young Chianti with fresh cherry and floral aromas. Medium-bodied with soft tannins and loads of mineral, berry and cherry character. A beautiful finish, a great value! 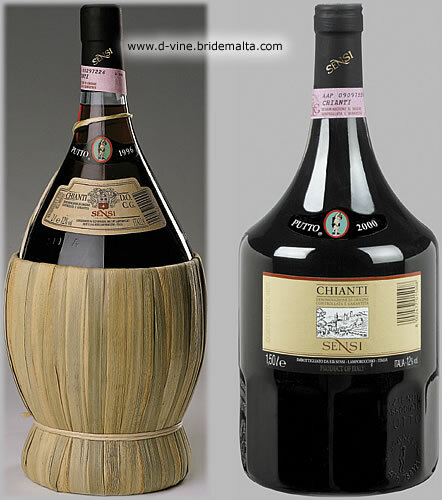 A thoroughly delicious aged Chianti with excellent aromas of ripe plums and berries. Medium-bodied with velvety tannins and a lovely, sweet aftertaste. 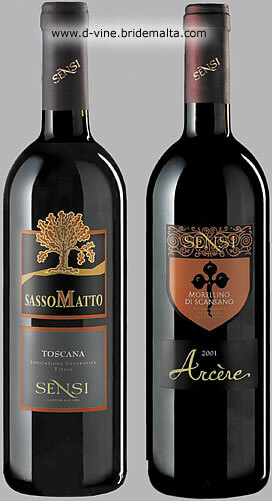 Produced in limited quantities and made out of 100% Sangiovese grapes. It is aged for 12 months in oak barrels and a further 6 months in the bottle. It is well structured red wine with hints of flowers, red fruits, smooth tannins, tobacco and mineral aromas. An unusual and very interesting blend of two strong and elegent grape varieties, Sangiovese and Syrah. They are separately fermented, then blend together to be aged for 12 months in oak barriques obtaining a perfect balance between the fine aromas of tobacco, spices, vanilla, velvety tannins and blackberry fruits, exalted by a full bodied and wrapping taste. 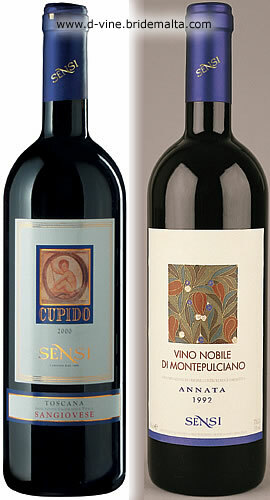 Like the Brunello it is produced from Sangiovese Grosso grapes. It is aged for 2 years, part of which in wood. A bodied and structured wine with a deep red colour and a full and velvety taste. These Nebbiolo grapes come exclusively from estate vineyards. Attentive fining of 12 to 18 months in lightly toasted barriques exalt the bouquet, contributing scents of vanilla and roasted hazelnuts. The wine is offered for sale after 24 months of additional fining in the bottle to enable this superb wine to develop a big structure and body. Barolo is produced from Nebbiolo vines. It’s grandeur is set off by the length of time it spends maturing and ageing, partly in oak casks and partly in the bottle. A distinctive ethereal nicely intense bouquet. The taste is dry, full-bodied and mouth-filling, demanding but velvety and well-balanced. The grapes for this wine come from vineyards in the heart of the Barbaresco zone that are particularly suited to the. production of fruit of fine quality. Once fermentation is completed, the wine matures for 12 months in oak casks and it is then fined for one year more in the bottle before being sent to the market. Garnet-red in color with an intense aroma featuring scents of spices. The flavor is full and elegant. A strong wine. Cabernet Franc has all the qualities appreciated by red wine lovers. It has clear andpleasant grassy tones especially if enjoyed young. Over time it acquires an aristocratic completeness and roundness. Although its name originates from the famous Umbrian city of Orvieto, this white wine is normally considered a Tuscan-adopted due to the grapes it is made from. 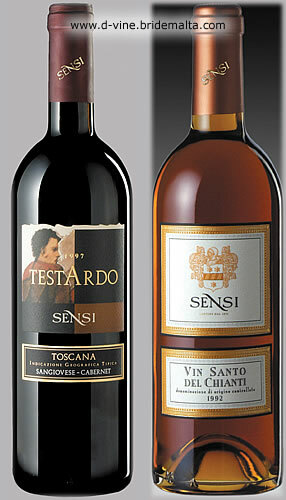 : Trebbiano di Toscana, Verdello, Canaiolo bianco, and Malvasia di Toscana. It has a light and fruity taste and a pleasant bouquet. Light straw - yellow in colour, delicate, persistent, very floreal bouquet, typical of great wines.It’s best aspect can be caught in its composite long-lasting flavour where, in the mouth, a continuous evolution of sensations can be perceived. Alcohol brings out its heat and softness while the balanced acidity reveals its liveliness and freshness. This white wine is made entirely out of Ribolla Gialla grapes from the Doc Collio area in Friuli. At one time it was solely drunk sweet and abounding in must, but this wine is at its best when perfectly dry, thus reaching the very highest levels of elegance. Very enjoyable, it’s characterized by an immediate sensation of freshness and liveliness, accentuated by delicious lemon overtones. 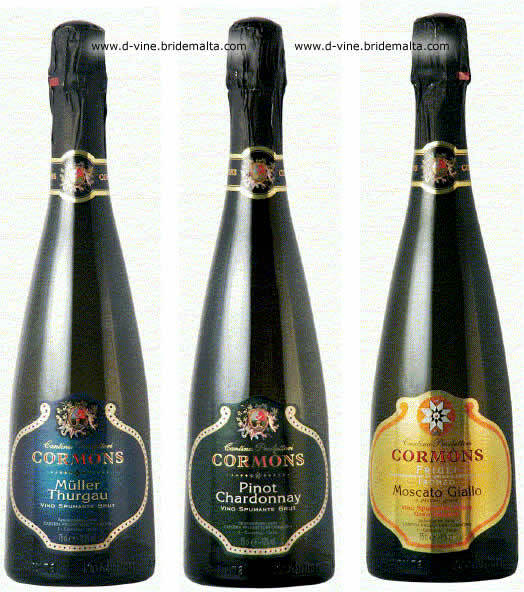 Cantina Produttori Cormons have selected the best Prosecco wines to obtain using the Charmat method, very agreeably a sparkling wine that is characterized by very fine pelage and that have a very limpid colour, just a hint of yellow verging on transparent white. 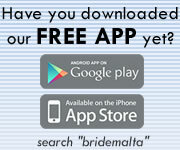 This page has been visited 62854 times.